Picasso is clearly one of the most successful artists of modern times. He must have been born under an exceptional star for he was successful from his teenage years when he arrived in Paris and by his mid-20s he was avidly collected. He became the equivalent of a rock star and stayed that way until his death at 92. Three of us went up to see the Picasso exhibit at the deYoung Museum in San Francisco. It was an extensive collection that represented "every phase of his long career" including paintings, sculptures, drawings and prints. At the end of two hours of viewing and listening to the audio tour, all of us had the same reaction: "I don't get it." It's clear that Picasso broke with the norms of his time and that he was trying to express time and space in a way that had never been done on a two-dimensional canvas. Give him points for genius. But, up close, his work is ... well, it is just ugly, dull and sloppy. He is credited with creating 50,000 works of art ... perhaps that's the reason most of his work looks unfinished and rushed. One painting had a horizontal line through the middle of it that was still visible even though it looked like he changed his mind and just scratched it out. A painting of his son has a realistic face on top of a barely realized harlequin suit and a sketched-in piece of furniture hovering over what looked like three cartoon feet. In many of the paintings there are what look like left over artifacts of previous studies. Throughout the exhibit, quotes from Picasso were written on the wall and included on the brochure that was handed out. According to the brochure he once commented, "Painting is just another way of keeping a diary." That is exactly what his work looks like, quick sketches of his chaotic life as he moved from one woman to another, using the barest strokes to indicate their feminine form and being done with the women almost as quickly as he was done with a painting. And yet, one piece of information from the audio tour indicated that he did over a thousand study drawings when preparing for one of his paintings. After the exhibit, Picasso remained a puzzle for me. On the whole I don't like his work and don't understand why he became so popular so quickly and remained that way his entire life. The debate about what is art is endless and the question of what is great art even more complicated. I'm sure my inability to appreciate the most influential artist of our time is more a reflection of me than it is a judgment of him He has been judged by the world and found great ... but I still just don't get it. 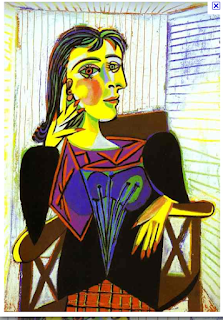 This image is Picasso's "Portrait of Dora Maar" ... one of the few I really liked. Don't apologize for your views of the art, Joyce. You are giving an honest opinion. I was just watching a video review of Gerhard Richter's work at Tate Modern. Adrian Searle notes at the end that it is up to the viewer to make meaning of the art, not the painter to tell us what it means. I take from Searle's comment permission to have whatever reaction we have. I think also that one can appreciate innovation and creativity in an artist and still not like the work. Perhaps it's just the shock value of his life. Sometimes I think being a successful artist is really all about drawing attention to yourself and being outrageous... But that's probably a snarky thing to say. I never really liked Van Gogh, either. But then for me art has always been about how it makes me feel and less about how good it is. Maybe people in Picasso's generation wanted the feelings they got looking at his work? Since Picasso was wildly popular from the early 1900s until his death in 1973, that's a lot of people who wanted that feeling. I wonder if it's a case of "The Emperor's New Clothes." Perhaps his early work was shocking and ground breaking and people equated that with great. I would love to hear from someone who really likes his work so I could hear a different perspective. Thanks for the comments! HI JOyce -- I tried responding the day I read this -- and the Internet access at the lake is soooo bad, my comment kept getting lost. Like you, I am not a big Picasso fan -- I often find abstract art to be confusing -- and in some ways, Picasso is a perfect example of that confusion! But... I think it is that in the times, he was so 'out there' he shocked people -- art was meant to be a representation of reality -- even the Impressionists kept reality at the foundation. And there was this mad man putting cubes and triangles and globs of painted body parts where ever he wanted -- shocking! His art had value because of the times in which it was created. In today's times Picasso would be almost pedestrian in his interpretations -- but then? Wow -- this was a man who painted through WW1 and the Nazi juggernaut. He painted through jazz and blues and Cole Porter and Fitzgerald. He painted in the times and turned the world upside down -- he took risks and used colour to express the turmoil and craziness of a world gone mad with war. He opened doors for you and me to express ourselves freely today -- that's what I like about Picasso. He took risks no one ever thought to take with art and created a foundation for even better art to be created today. C.C. has two limited edition Picasso prints that hang in our living room. I look at these two paintings and am in awe of his use of colour and shape. Of the statement he makes about how nothing is at it appears -- like the times in which he painted. How cubism lead to camouflage painting of trucks in WW1 -- nothing is as it appears -- and everything leads to something else. Louise ... I think you're absolutely right and perhaps it's enough to respect him for his courage to make a break with the expected norm and to give us something to think about and ask "why?"